Planning a trip to Walt Disney World with decadent touches can be overwhelming for even veteran visitors. After all, the resort's 40 square miles are home to four major theme parks, hundreds of activities and attractions, and something in the neighborhood of 500 places to eat, drink, and be Disney. But those who do their homework will find Disney World offers a lot of luxurious possibilities--some with bargain price tags. Stay Disney--Disney World-owned-and-operated resorts offer many advantages, starting with complimentary Magical Express baggage service, which includes transportation from Orlando International Airport. Other advantages include convenient locations, themed resorts, youth services and facilities, all-in-one ticketing, parking fee exemptions, and preferred tee times for golfers. Location, Location--Those with young children will want to consider one of the monorail resorts, such as Contemporary Resort or Grand Floridian Resort & Spa, with monorail connections to Magic Kingdom and Epcot. Adult couples visiting without children might enjoy a location close to Epcot and Hollywood Studios or shopping on the BoardWalk. What Line?--Disney's free FASTPASS system allows in-the-know guests to avoid waiting at certain popular attractions in all four theme parks. If the posted wait time for an attraction is long, guests can obtain a no-fee FASTPASS with an assigned return time (including an hour-long window) for little or no waiting. Extra Magic--The Extra Magic Hours program is available to those staying in Disney World-owned-and-operated resorts, plus Walt Disney World Swan and Dolphin, Shades of Green, and the Hilton at Downtown Disney. Different parks offer exclusive access one hour before the regular opening time and up to three hours after the regular closing time. Decadent Spa--Amid plentiful Disney World spa options, The Spa at Saratoga Springs Resort & Spa has themed treatments and packages, such as hot-stone therapy and experiences for kids age 4 to 12. The Mandara Spa at the Swan and Dolphin radiates Balinese tranquility and features Eastern-leaning treatments, including special Mandara Generation YSpa offerings for teens. Retail Therapy--In Downtown Disney, TrenD carries chic sundresses, handbags and more with subtle Disney designs. Hoypoloi features fine art and jewelry pieces. Once Upon a Toy in the Marketplace is a great place for kids to build and customize toys in five themed rooms. On Stage--Cirque du Soleil's La Nouba is, as its French-derived name suggests, a party--colorful costumes and daring acts. 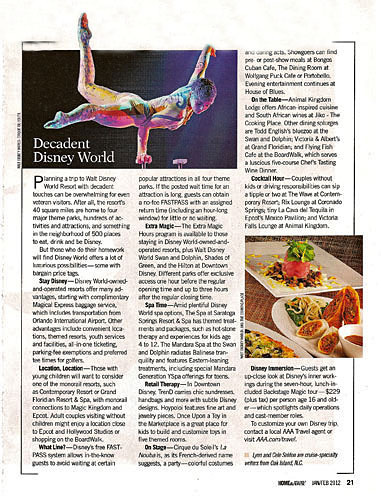 Showgoers can find pre- or post-show meals at Bongos Cuban Café, The Dining Room at Wolfgang Puck Café, or Portobello. Evening entertainment continues at House of Blues. On the Table--Animal Kingdom Lodge offers African-inspired cuisine and South African wines at Jiko-The Cooking Place. Other dining splurges are Todd English's bluezoo at the Swan and Dolphin; Victoria & Albert's at Grand Floridian; and Flying Fish Cafe at the BoardWalk, which serves a luscious five-course Chef's Tasting Wine Dinner. Cocktail Hour--Couples without kids or driving responsibilies can sip a tipple or two at The Wave at Contemporary Resort; Rix Lounge at Coronado Springs; tiny La Cava del Tequila in Epcot's Mexico Pavilion; and Victoria Falls Lounge at Animal Kingdom. Disney Immersion--Guests get an up-close look at Disney's inner workings during the seven-hour, lunch-included Backstage Magic tour--$229 (plus tax) per person age 16 and older--which spotlights daily operations and cast-member roles. To customize your own Disney trip, contact a local AAA Travel agent or visit AAA.com/travel.